Planning a class can be one of the most challenging obstacles for a yoga teacher, especially when they are just getting started. There is so much more to keep in mind than just themes and intentions. You need to consider how to properly work towards a peak pose, how to allow for the right amount of time for everything you have planned, how to give your students a well-rounded practice that creates balance in the body, and so much more. A lot of thought and preparation goes into planning a class, but taking note of these common sequencing errors can hopefully make the process a little easier, and allow you to thoughtfully plan your next class. When a student comes to their mat, they most likely are looking forward to getting some movement in. They generally will have the expectation that they will get moving rather quickly, and then slow down towards the end of the class. While you may want to begin opening certain muscles for the peak pose through static postures, it’s best to find ways to do so through poses that allow for more movement. By starting with static poses, you’re neglecting that desire for movement, and will possibly bring the energy of the class down—making it ultimately more difficult to reach that peak pose. Begin the class with poses that will bring gentle movement to your students’ bodies, so that they can warm up and be fully prepared to progress towards more intense movements, if that is what your class entails. Poses like Cat/Cow (Marjaryasana) and Bird Dog Crunches allow your students to warm up their bodies with gentle movement. Save the stillness for the end of the practice, as you begin to slow down the class and work towards moving into Savasana. Beginning the class with an intricate pose can be just as detrimental to the flow and energy of the session as starting with slower movement. By first choosing poses that require a lot of instruction and specific alignment cues—especially in lower level classes where students need a lot of guidance—students will be more focused on paying attention to you and trying to figure out how to get into the pose. This stops them from letting go and settling into the class. Choose simpler poses that don’t require a lot of breakdown. Focus more on breathing and focusing on the present moment, rather than complicated, multi-layered alignment cues. In a typical 200 hour teacher training program, you are given a basic guideline to create your classes off of. It is often tempting to break away from that class outline as quickly as possible in order to establish your style as a teacher. As you are gaining experience and finding your voice, you want your students to learn from your personal perspective, not a basic outline that every other teacher in the studio is following. While it is important to develop your own unique approach, it’s far more pertinent that you ensure you are providing a thought out, well-rounded practice. Sometimes it is necessary to go with the tried-and-true option in order to provide the best experience for your students. If you decide to deviate from the outline that you were taught, carefully think through how it will affect your class. What does the component that you are eliminating offer? Are your students still going to reap those benefits in other parts of your sequencing? Is your personal addition helping your students in their yogic journey in the best way possible? If you don’t feel that it will truly enhance both the physical and spiritual journey for your students, go back to the drawing board and rework what is necessary. Creating personal touches in your sequences is an important part of developing yourself as a teacher, and it’s okay to distance yourself from the guidelines you were taught and explore other possibilities. However, make these changes with careful thought. Experiment by mixing things up in small increments, rather than throwing everything out the window all at once. It is easy to get carried away and build upon a pose too much on one side. You may start with a simple set of poses, but end up spiraling into a complicated string of postures that take you far away from the starting pose. While it can be fun to test your limits and challenge the norm, it is possible to go too far. By over-stacking on one side, you may end up depleting the physical energy and focus of your students. Their attention will be on trying to get to the end of the series, rather than really tuning in and listening to their body. Not to mention, having to repeat the sequence on the other side may seem like an impossible feat, and you may have more students choosing to rest than balance out the series. Rather than going deep into a series of poses on one side, choose a select few that compliment each other and help the students flow seamlessly from one posture to the next. Focus on poses that have a similarities, such as Warrior II (Virabhadrasana II), Triangle Pose (Trikonasana), and Extended Side Angle Pose (Utthita Parsvakonasana), which all have the same foundational standing base. As you are creating the sequence, keep in mind the levels of yogis in your class, and what poses will allow them to maintain their energy and focus. In addition to doing what is best for your students, selecting only a few poses will help you with memorization. You’ll be able to focus on assisting students with alignment and gracefully moving through the postures, rather than being distracted by trying to remember what comes next. Outside of the yoga studio, people often associate Seated Forward Fold (g) as a precursor to more intense physical activity, like running or playing sports. It is used as a tool to open up the hamstrings and bring some movement to the spine. In reality, in order to perform the pose to the best of your ability, Seated Forward Fold requires you to be open in your hamstrings, as well as elongated and properly aligned through the spine. At the beginning of class, students simply won’t be warmed-up enough in order to really benefit from the pose. It is best to perform poses that will warm up the body, and then eventually work towards Paschimottanasana. Save the pose for the end of class as you are slowing down. The hamstrings and hips will be much more open and the spine will be warmed-up, allowing students greater access towards their feet. One of the most challenging parts of sequencing a class is getting the timing right. More often than not, a class won’t go exactly as planned—students may need more help than anticipated with alignment for certain poses, sequences may go longer than planned, or you simply might go through the class slower than when you rehearsed. Whatever the reason, the wind down into Corpse Pose (savasana) is the section most likely to suffer from a class that is running too long. It is easy to find yourself cueing into savasana without fully slowing down the class and working into it, simply for the sake of time. 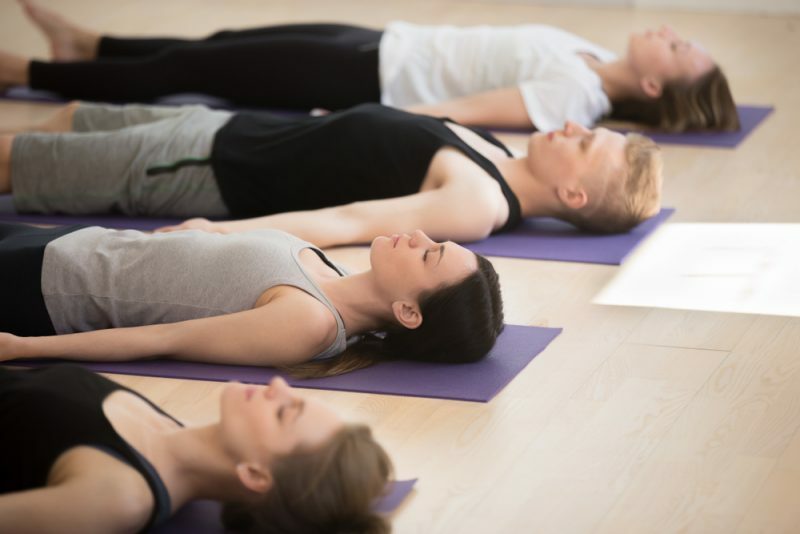 Savasana is one of the most important poses of a yoga practice—it relaxes both the mind and physical body, while allowing the student to fully absorb the work they did in class. WIthout properly slowing down the class and easing into the pose, your students won’t be able to fully release into the posture and reap the many benefits. It will feel forced, rather than intentionally cued. In order to ensure you don’t end up neglecting the build to savasana (and the pose itself), don’t jam pack your class with poses. Leave wiggle room in the schedule so that you can ensure you don’t cut into the slow down section. If you end up having extra time that you need to fill, have a series or two in your back pocket that you can turn to in order to make up the time. Planning less for your class will ensure there is no chance you end up sacrificing the build up into savasana. Creating a sequence for a yoga class is challenging, and you’ll undoubtedly run into some mistakes along the way. These guidelines can help you avoid some of the most common pitfalls yoga teachers face. If you are still struggling with yoga sequencing in your classes or at home, consider purchasing a book that offers some guidance. Two great jumping off points are either “Yoga Anatomy” by Leslie Kaminoff and Amy Matthews, or “The Mark Stephens Yoga Sequencing Deck” by Mark Stephens. As long as you mindfully create sequences that make sense physically, spiritually, and energetically, you’ll leave your students with a balanced, well-rounded practice.